It started when I wrote a paper on mitigation of turtle road mortality for The Environmental Policy Clinic during my senior year at Pace University. That summer I worked with Professors Matthew Aiello-Lammens and John Cronin on the turtle road mortality mitigation project in Cold Springs, (a project funded by a grant from The Department of Environmental Conservation (DEC) to Pace’s Environmental Studies and Science Department). Professor Aiello-Lammens and I continued talking about the turtle road mortality research. I said to Matt, “You know what will really get that project going? Studying how to make the culvert attractive for the turtles. I read that light penetration levels and the size of the culverts have a big influence on the turtle’s decision to utilize them or not. I would like to run that project because if it works out that research may be of some value and actually make a difference in the world. I’m curious to see what will happen.” Matt quickly grabbed his pen and pad and made a note of it. He told me he would contact someone at DEC to see if I could work under the grant. A few days later, Matt gave me the thumbs up. Amphibian and reptile populations are in decline. Roads run through migrational paths or right through good habitat for these species. Thinking of turtles specifically, mortality due to vehicle collision is way too common. Female turtles leave the wetland and travel upland to drier areas to lay their eggs. During their travel, they encounter and cross multiple roads. If they survive the dangerous roads and lay their eggs, they must cross the roads again to get back to their homes. The hatchlings must also make the same journey. Their population is in decline because egg-bearing female turtles and the hatchlings are not making it safely across the roads. It’s possible that drainage pipes under the roads (i.e., culverts) could be placed in areas with high mortality rates. Unfortunately, the turtles might not use the pipes and will continue to cross the roads. It seems the turtles do not feel comfortable going through the pipes due to length, width and light level inside the culvert. The research I am conducting involves observing turtle behavior, recording which light and color manipulated tunnel they decide to use, the minimum amount of light needed to make the tunnel attractive for use and the time it takes for them to make their decision. I’m hoping that this research will show that only minor modifications would be needed on existing culverts to make them more appealing. I wanted to research something that hadn’t been done before and that could really make an impact. Then I remembered a paper I came across that vaguely mentioned light levels and culvert width. I didn’t want to do the same exact research they did so I included the treatment of different color tubes to see if that makes a difference in the turtle’s decision-making. First I had to come up with a project design and list the materials needed. I used Google Earth to find possible turtle capture sites and then I drove to the sites and spoke with locals to confirm the presence of turtles. I shopped around and haggled with venders searching for the cheapest prices on materials trying to stay below the $1,500 budget. Matt and I took a U-Haul trailer up to Oneonta to pick up the material and drove them down to Pace’s water tower. I built a large box to place the turtles in and put together the pipes. Constructing the study area took a lot longer than expected, almost a whole month. Also I learned that I am a horrible carpenter but I did improve over time! 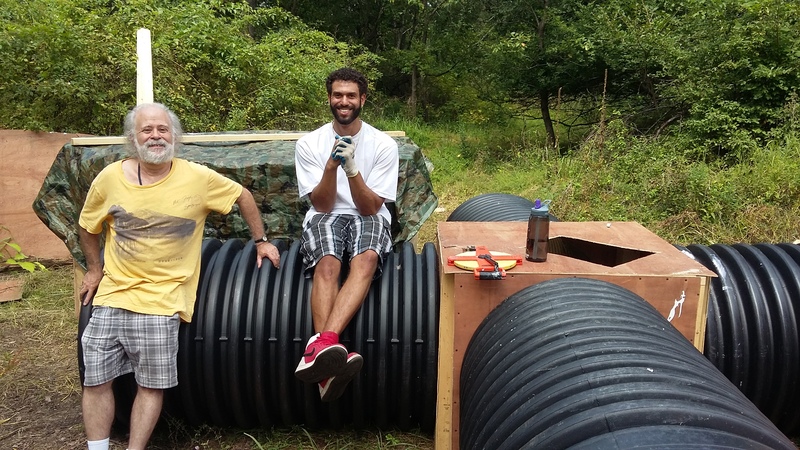 I wanted to simulate a culvert as best as possible using plywood so instead of building a box-like extension for the pipes, I was able to roll and bend the plywood into a circle with the diameter close to 30 inches. With the culvert simulator complete, now I go and set turtle traps in water bodies in the area, bring the turtles back to Pace just long enough to observe them selecting culvert tubes, then bring them back to where I caught them. Professor Joshua Schwartz (left) and Norman Sanchez pose with a culvert simulator. Photo by Matthew Aiello-Lammens. 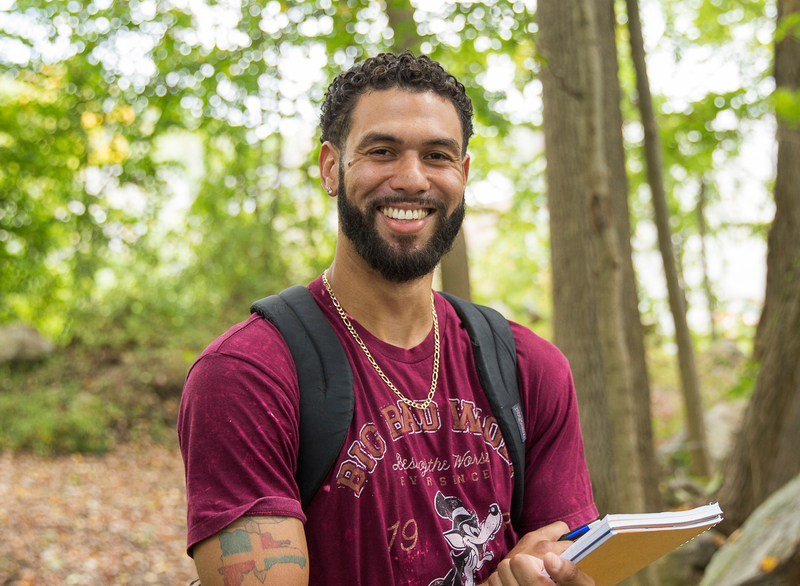 Norman Sanchez is working on a thesis in the Master’s in Science in Environmental Science program at Pace University on the Pleasantville Campus. He also received his BS in Environmental Science from Pace. Norman is advised by Prof. Josh Schwartz (Biology, PLV), and has been partially supported by a grant from the Hudson River Estuary Program.